The Honda Dio was introduced in Japan in January 1988. The name is derived from the son of Venus ‘dyonisiac’. It is now manufactured and assembled in India by Honda’s HMSI subsidiary, from where it is exported to UK as the Honda Lead. The Dio is equipped with cushioned seats and also a spacious under the seat storage box. The Japanese Dio was equipped with the two-stroke 50 cc AF18E single-cylinder engine with electric start. It is superficially similar to the USA-only onda ‘Elite S’. Later versions in some markets were equipped with a 102 cc air-cooled, four-stroke, single-cylinder, OHC engine with both electric self-start and kick start. This model was not exported to the USA. In 2012, HMSI launched a new Dio at Auto Expo in India. 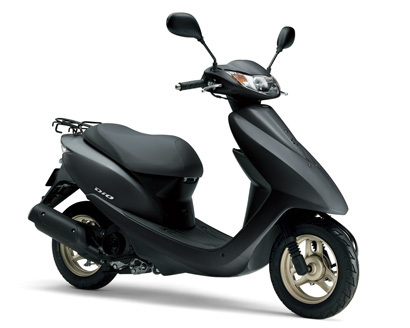 It has a new 110 cc engine which also runs Honda’s Activa and Aviator. It also has a new look and new headlight. The 2013 HMSI Dio had claimed improvements in fuel economy and combined brakes.